How about showing vegetarians some love at Thanksgiving? At Laziz Kitchen, Moudi Sbeity combines the traditional flavors of his native Lebanon with quintessential comfort foods, such as their local favorite spice-dusted French fries. He’s created a homey casserole makes for a savory do-ahead side dish and is hearty enough to keep the hungriest vegetarian guests satisfied as a main offering. “The casserole does not need to be baked,” Sbeity says, but some cooks prefer it served hot. The equally delicious option of serving at room temperature makes it a perfect potluck contribution. • If serving hot, preheat oven to 350 degrees. • To a non-reactive medium bowl combine yogurt, tahini, lemon juice, water, one clove mashed garlic and cumin. Add salt and pepper to taste, mix well and set aside. • Remove stem end and slice eggplant lengthwise into long 1/3-inch slices. To a large skillet over medium heat, add olive oil. Fry the eggplant slices on both sides until golden brown. • In a saucepan over medium heat, gently boil garbanzo beans with their liquid and two cloves chopped garlic. • To the bottom of a casserole dish, add a layer of pita chips. Lightly sprinkle some of the garbanzo bean cooking water on top to slightly soften. • Layer the eggplant slices evenly over the pita chips. Drain the garbanzo beans and layer beans on top of the eggplant. • Spread the yogurt-tahini mixture evenly over the top of the casserole. • If desired, bake casserole for 15-20 minutes, or until bubbly. • Meanwhile, in a small skillet, melt butter over medium heat. Add pine nuts and toss to coat with butter, toast until brown and fragrant. 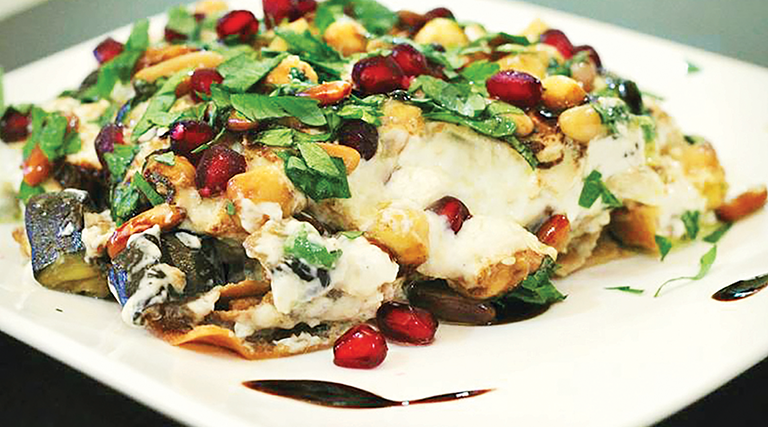 • Top the casserole evenly with toasted pine nuts, parsley and pomegranate arils (if in season). Dust with dried sumac.